of inner strength by relying on the power of the mind. 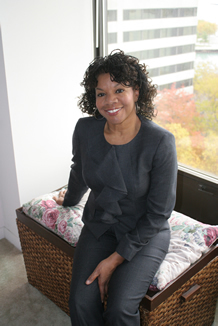 Denise Crittendon is an award-winning journalist and the founding editor of the former African American Family Magazine, a lifestyle magazine for black families in Metro Detroit. She’s also known for "Positive Thoughts," a self-help column that appeared once a month in The Detroit News. The Detroit native and journalism graduate of Michigan State University worked for 15 years as a reporter/features writer for The Detroit News. In 1994, Ms. Crittendon became the first woman in the history of the NAACP to be appointed editor of its national magazine, The Crisis (founded in 1910 by W.E.B. Dubois). She also worked as reporter/ features writer and assistant teen page editor for the Kansas City Star newspaper in Kansas City, Missouri. In addition, she is author of Life Is A Party That Comes With Exams, a youth empowerment guide and Girl In The Mirror: A Teen's Guide To Self Awareness, a book that focuses on the character development, self esteem and self empowerment of pre-teen and teenage girls. In 2001, she received the Detroit City Council's "Spirit of Detroit Award" and was honored by the Women's Informal Network as "One of the Most Influential Black Women in Metropolitan Detroit.” Other honors include a 1986 National Press Foundation Fellowship to study Spanish for three months in Cuernavaca, Mexico and a 1987 Rotary Foundation Fellowship for International Understanding. Under the fellowship, Ms. Crittendon traveled throughout Africa and studied for a year at the University of Zimbabwe in Harare, Zimbabwe, near South Africa. Ms. Crittendon has taught magazine and feature writing classes as an adjunct professor in the Journalism Department at Wayne State University in Detroit and served as a panelist and moderator for “Reclaiming The Village,” a series of panel discussions that focused on challenges facing the African American family and community. The eight-week program aired on WTVS Channel 56 and WB20 in 2005. This past January, 2012, Ms. Crittendon was seen on CW50’s Street Beat discussing Michigan’s new anti-bullying legislation with community correspondent, Cindy Kainz. On the show, Ms Crittendon explored affirmations and other confidence building tools presented in her youth empowerment books. Besides numerous television appearances, she has been a guest on Sirius XM Radio, The Joe Madison Show, a.k.a. the Black Eagle; the Black Talk Radio Teen Empowerment Show with host, Scotty Reid, The Mix, 92.3 with Frankie Darcel, and was featured in the “Powerful Detroit Women’ series, with host Cocoa. An avid motivational speaker, Ms. Crittendon has delivered her message of empowerment at middle schools and highschools, churches and community centers. She has addressed youth and parents as well as educators, social workers and civic leaders at conferences in Michigan, Indiana, Wisconsin and in Portland, Oregon where she delivered a keynote speech to mothers and daughters attending a town hall meeting. Ms. Crittendon is also the founder of Esteem Multimedia, a local company that provides writing, editing and self-publishing services for aspiring writers. She currently teaches English at Wayne County Community College (WCCCD) in Detroit.